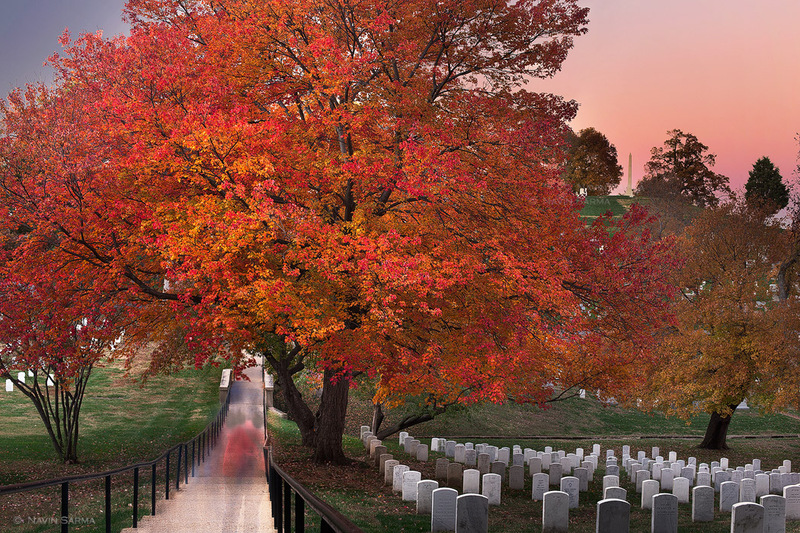 During a fall sunset, vistors walk the passageways of the Arlington Cemetery, and pause with solace. The effect of a long exposure shows visitors streaking along the walkway. Their ghostly figures are a metaphor for the burial grounds: that each one of the headstones represents a person who once stood tall and independent, but has since passed. The separation between the walkway and the grounds echo the differing worlds of the living and the passed. Though darkness has fallen on the scene and on what we can understand, the transition to the vivid pink sky, behind a high hill of ornate memorials, suggests optimism in the afterlife. WOW!!!! This is incredible!! I have to share it with my husband. He is a 30 year retired Marine. He will love this. WOW!! !